Size 7 - 7.5 There are 19 products. 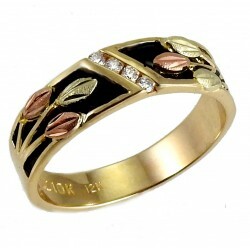 10K Gold Ladies Rose Ring Accented with classic Black Hills Gold design of 12k rose and green leaves Ring measures approx. 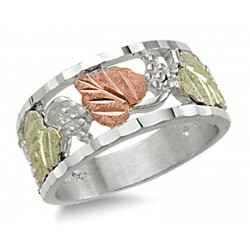 0.35 inch wide Made in USA Ring size: 7Handcrafted in the Black Hills of South Dakota. Comes in a gift box with a Certificate of Authenticity and a warranty card. 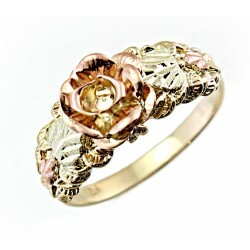 10K Black Hills Gold Diamond Ring Features three diamonds .06 CT TW Decorated with 12K rose and green gold leaves Width: 0.278 inch Made in USA Ring size: 7Handcrafted in the Black Hills of South Dakota at the time of order. Comes in a gift box with a Certificate of Authenticity and a warranty card. 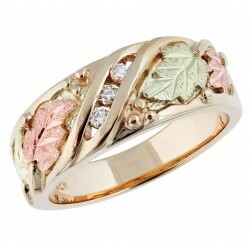 10K Black Hills Gold Diamond Ring Features three diamonds .06 CT TW Decorated with 12K rose and green gold leaves Width: 0.278 inch Made in USA Ring size: 7.5Handcrafted in the Black Hills of South Dakota at the time of order. Comes in a gift box with a Certificate of Authenticity and a warranty card. 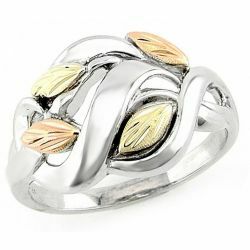 Black Hills Gold sterling silver ring Decorated with 12K gold leaves Width: 0.383 inch Made in USA Ring size: 7Landstrom's Original Black Hills Gold Jewelry Handcrafted in the Black Hills of South Dakota. Comes in a gift box with a Certificate of Authenticity and a warranty card. Stunning 10K Black Hills Gold Opal ring / G LLR2963 Featuring a 5X7mm Lab. created Opal gemstone Width: 0.50 inch Decorated with 12K rose and green leaves Made in USA Ring size: 7Handcrafted in the Black Hills of South Dakota. Comes in a gift box with a Certificate of Authenticity. 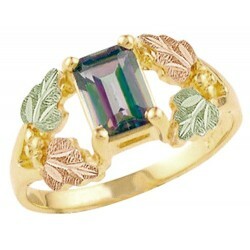 Landstrom's® 10K Black Hills Gold ring Featuring a 5mm x 7mm Mystic Fire Topaz gemstone Decorated with 12K rose and green leaves Ring measures approx. 0.40 inch wide. 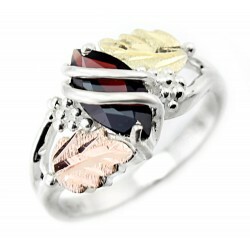 Made in USA Ring size: 7Handcrafted in the Black Hills of South Dakota. Comes in a gift box with a Certificate of Authenticity. 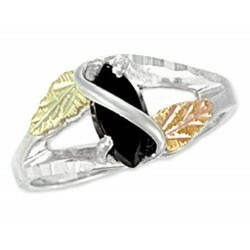 Landstrom's Black Hills Gold on Sterling Silver ring / MRL02668 Accented with classic Black Hills Gold design of 12k leaves Ring 0.5 inch wide Made in USA Ring size: 7.5Handcrafted in the Black Hills of South Dakota. Comes in a gift box with a Certificate of Authenticity and a warranty card. 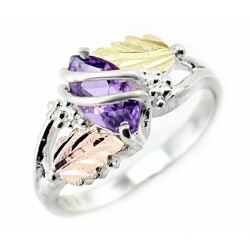 Black Hills Sterling Silver ring Decorated with 12k gold rose and green leaves 10mm x 5mm genuine amethyst Width: 0.417 inch Ring size: 7 Made in USA Handcrafted in the Black Hills of South Dakota. Comes in a gift box with Certificate of Authenticity and Manufacturer's Lifetime Warranty against Defects in Materials and Workmanship. Black Hills Sterling Silver ring Decorated with 12k gold rose and green leaves 10mm x 5mm genuine garnet Width: 0.417 inch Ring size: 7 Made in USA Handcrafted in the Black Hills of South Dakota. Comes in a gift box with Certificate of Authenticity and Manufacturer's Lifetime Warranty against Defects in Materials and Workmanship. 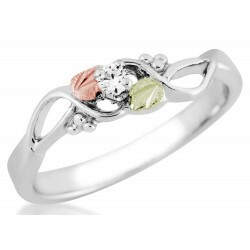 Black Hills Sterling Silver ring Decorated with 12k gold rose and green leaves 8mm x 4mm genuine garnet Width: 0.331 inch Ring size: 7 Made in USA Handcrafted in the Black Hills of South Dakota. Comes in a gift box with Certificate of Authenticity and Manufacturer's Lifetime Warranty against Defects in Materials and Workmanship.